Astronaut photograph ISS057-E-115019 was acquired on December 7, 2018, with a Nikon D5 digital camera using an 800 millimeter lens and is provided by the ISS Crew Earth Observations Facility and the Earth Science and Remote Sensing Unit, Johnson Space Center. The image was taken by a member of the Expedition 57 crew. The image has been cropped and enhanced to improve contrast, and lens artifacts have been removed. The International Space Station Program supports the laboratory as part of the ISS National Lab to help astronauts take pictures of Earth that will be of the greatest value to scientists and the public, and to make those images freely available on the Internet. Additional images taken by astronauts and cosmonauts can be viewed at the NASA/JSC Gateway to Astronaut Photography of Earth. Caption by Andrea Meado, Jacobs Technology, JETS Contract at NASA-JSC. An astronaut shot this photograph of the chilly Moose River in Ontario while orbiting near the northernmost latitude limits (51.6°N) of the International Space Station. The mouth of the river was partially frozen, with flowing water pushing ice into James Bay, a southern extension of Hudson Bay. Landfast ice, or fixed shore ice, extended up to 7 kilometers (4 miles) from the land. The freeze-up of James Bay occurs annually from late November to early January. This image, taken in December 2018, shows ice growth in the midst of its freezing season in northern Ontario. Ice begins to form along tidal mudflats, where the water is fresher and shallower, and slowly continues to grow north into more saline bay waters. In the photo, landfast ice surrounding the Moose River outlet has a brighter white color and floats closer to shore. The grey colored ice out in the bay is thinner and younger. 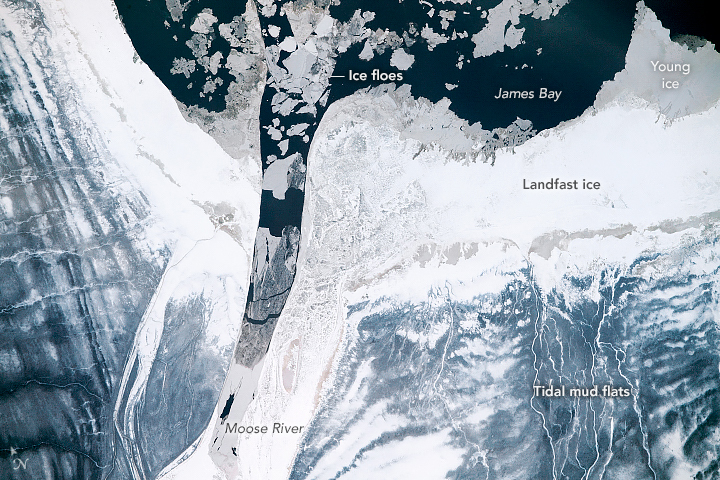 Ice floes forming in the Moose River are carried into James Bay and are broken up by currents. While this frozen landscape appears uninviting, nearby communities like Moosonee need below-freezing temperatures to build ice roads. Planes are necessary for travel between small towns along the James Bay during the short summers, but the construction of winter ice roads creates a rough connectivity for supplies and people in northern Ontario.